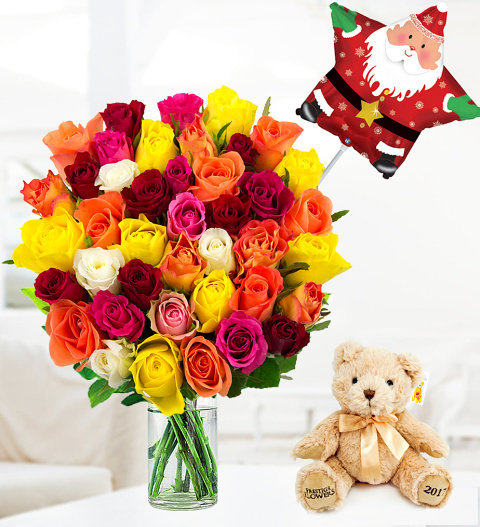 A festive floral classic with 40 beautiful roses expertly hand tied by our talented florists. A bouquet perfect to send for Christmas. Included is a Limited Edition bear named George who is looking for a home this Christmas. Also included is a festive stick balloon and a free box of Valley Chocolates! This is a fragrant arrangement that is perfect for all occasions with each rose measuring 35cm long. The colours are mixed with the size options adding 10 extra roses per upgrade. Chocolates may contain nuts.